Kevin Williams and Den DePaul discuss race relations. 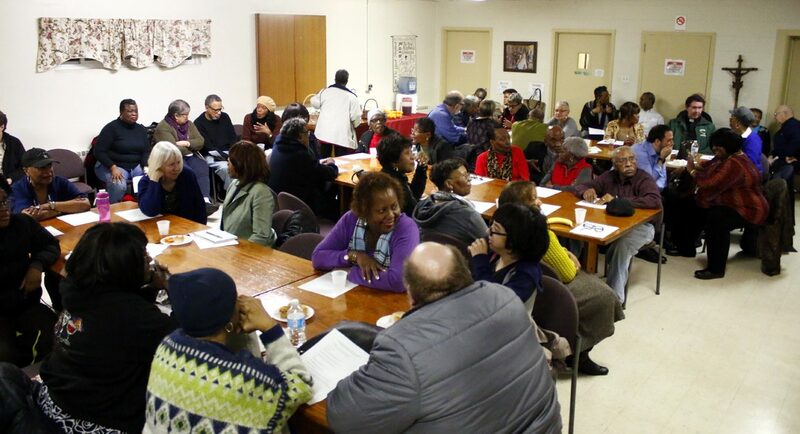 Those of different racial and ethnic backgrounds in the Philadelphia Archdiocese came together for a two-hour session, “Conversation on Race in Our Country,” Feb. 28 at St. Raymond of Penafort Parish in Northwest Philadelphia. 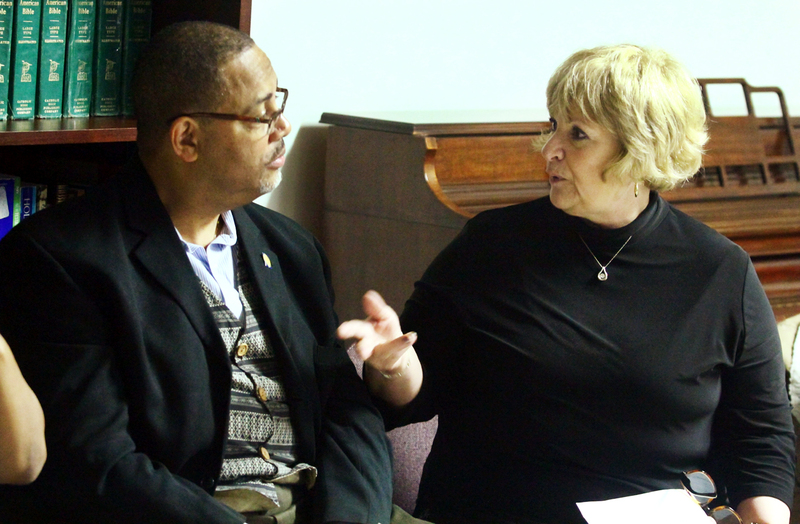 It was the first of three sessions in the “Growing in Racial Harmony within the Catholic Church: Continuing the Conversation” series. 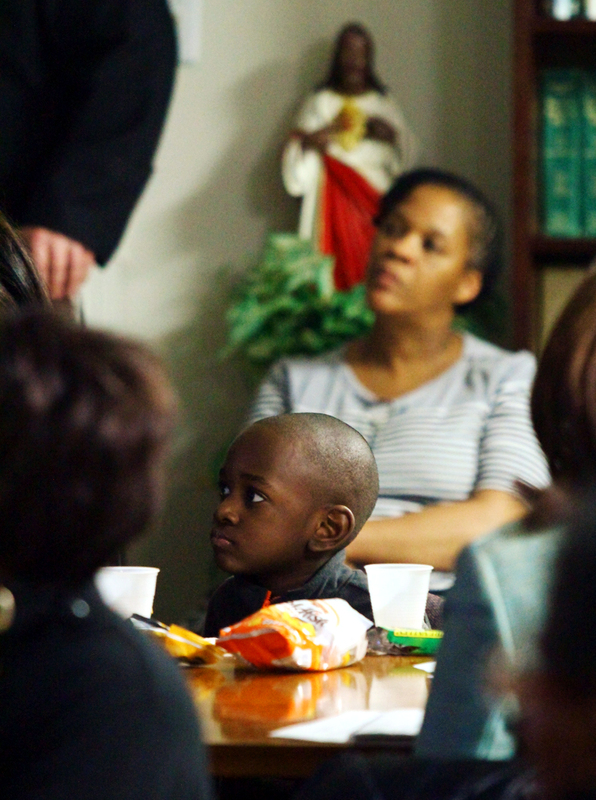 The featured workshop leaders included Father Christopher M. Walsh, pastor of St. Raymond; Deacon William Bradley, the director of the archdiocesan Office for Black Catholics; and Matthew Davis, the director of the archdiocesan Office for Migrants and Refugees. Along with parishioners from several parishes in the archdiocese, some priests also were present. Among the sensitive topics raised at the Tuesday evening session was knowing the difference between being color brave vs. color blind, analyzing the makeup of one’s social circles and admitting to the biases one may carry consciously or unconsciously. The program opened with prayers and the singing of “Amazing Grace.” After a reading of Scripture from Acts 17:26-29, there were prayers of intercession. 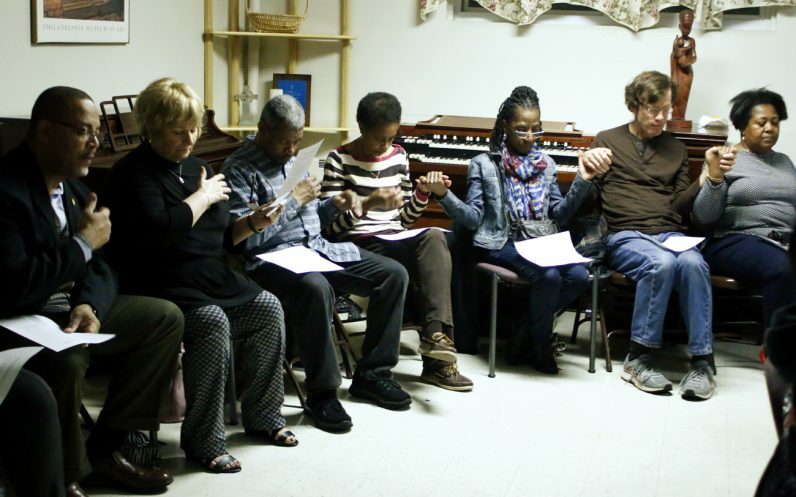 After everyone prayed the Lord’s Prayer, the participants broke up into small groups that included at least one person who was not African American. The first question was, when did one first become aware of racial differences and prejudices? Of those present, African Americans said they became aware of this at a much younger age than whites. Among the attendees who shared their personal experiences during the segment was Cynthia Brown, who is a vice president for a local corporation and a trustee at Our Lady of Hope Parish in the Logan section of North Philadelphia. Brown said she often works from her Chester County home. She shared an anecdote of how missionaries once came to her door and assumed she was the maid. “I told them that this was my home and that some of us do live in Malvern,” she said. The Feb. 28 session at St. Raymond’s was a continuation of the “A Dream in Black and White: Growing Understanding as Catholics” prayer service that was held recently on Martin Luther King Day. That inaugural event drew a standing-room-only crowd to St. Philip Neri Church in Lafayette Hill on Jan. 16. It was the 34th annual archdiocesan gathering to honor the memory of Rev. Dr. Martin Luther King Jr. and the first time the event was held in a predominantly white Catholic suburban congregation. The next session will focus on diversity in the pews, including ethnicity and social class, according to Father Walsh. The theme is “Racism and Prejudice Within our Parishes,” and it will be held at St. Athanasius Church’s school hall, 7105 Limekiln Pike in the West Oak Lane section of Northwest Philadelphia on Monday, March 13 at 7 p.m. This is so awesome! I wish we had this in Houston, TX. I attend a predominately Caucasian parish with a healthy amount of Latinos in Spring Texas. I can count on one hand how many African Americans I see at Mass on any given day. Also in the Youth dept. my daughter is often the only Black person in her class. While my church family is very loving and we get along with everyone very well, there are however times when we as a black family feel there are issues that our white and sometimes our Latino counterparts do not understand. I hope that programs like this can grow across the nation not only in Catholic parishes but in all Christian churches across the nation. The only way we can heal and understand one another is to reach out and peacefully communicate so we can end this division that has been proliferated especially now in this time of Trump. God Bless you all and much success!! This program is awesome. Wish I lived closer.